Section 310 of the California Building Code requires that all residences and rental property used for sleeping must have smoke detectors installed. Smoke detector fire alarms must be installed according to the manufacturer’s instructions, and must be fully functional and tested on a regular basis to be certain they are working. Cal Fire recommends installing smoke alarms in every bedroom, in the hallways leading to the bedrooms, and on each level of your home, including the basement. Smoke alarms should be mounted on the ceiling 4″ from the wall; wall mounts should be 4-12″ from the ceiling. Do not install near draft areas such as windows or vents. In California since 2014, new smoke detector fire alarms are required to have a long life, permanently enclosed battery with a 10 year rated lifespan. For older smoke alarms with replaceable batteries, change batteries once a year. If the alarm chirps, replace the battery immediately. Test the smoke alarm once a month by pressing the test button. Dust and cobwebs can effect their sensitivity. California Landlords are required by law to provide smoke alarms, and tenants cannot remove them. 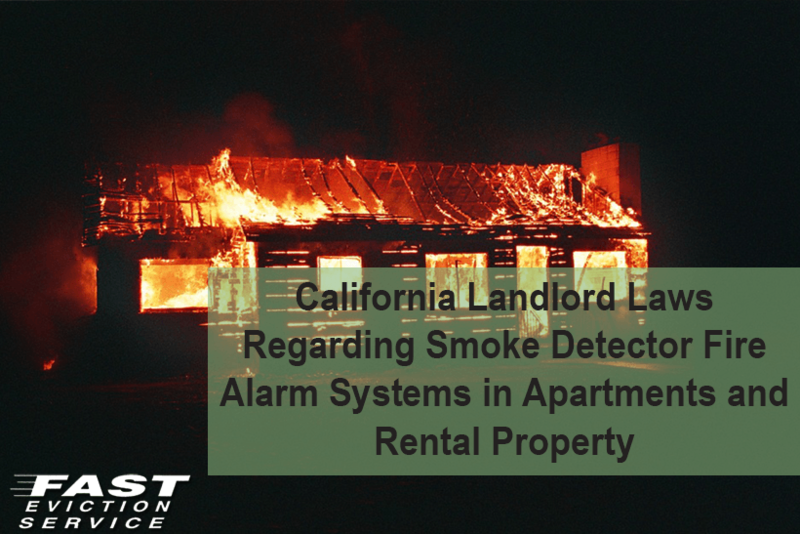 However, it is understood a landlord is limited in their ability to regularly test the smoke alarms which makes it the responsibility of the tenant to test it and replace batteries when necessary on older smoke alarms installed before 2014 in California. In addition to requiring smoke detector fire alarms in California rentals and apartments, the law also requires the installation of approved Carbon Monoxide Detectors in rental properties and single-family dwellings where there is a gas heater or appliance, a fireplace or an attached garage. Smoke detector fire alarms systems in apartments and rentals serve many important functions. Fire alarms are very loud and clear, providing the tenants with a chance to respond quickly. Efforts can also be made to extinguish the fire, which will limit the extent of damage. A proper fire alarm system ensures tenants an early warning, providing them with enough time to vacate the building. As such, most of the tenants will be able to get out before the fire spreads and they will be less likely to suffer from any serious injury. A fire alarm system can help you in reducing your potential liability should a tenant sue you for injuries in case of a fire. The prime reason behind this is that there will be a lesser number of injuries since you already have a proper system in place. Secondly, even if you do have to go to court, you can at least claim you did your part and the entire blame cannot be put on you. As a California landlord it is essential that you know the laws regarding smoke detector fire alarm systems for your apartments and rental property or you could face steep fines resulting from a building inspection or tenant complaint – or very serious liabilities in the unfortunate event of a fire. Be certain your tenants know and understand their responsibility to test and maintain the smoke detector fire alarms in their rental units on a regular basis.